Ice fishing is not something that everybody gets excited about. It’s cold, you’re generally in a remote location, and you normally don’t have access to typical amenities such as indoor plumbing. I had the opportunity to give it a try myself last winter and, although I was a little skeptical at first, we ended up having a great time. Our greatest concern was making sure we had enough wood for the small stove my friend had in his ice hut. Fortunately, he came prepared as he had a gasoline-powered chainsaw that was perfect for chopping up some fallen trees located nearby. It wasn’t a large chainsaw, but it was more than enough for what we needed it for. While size does matter in some circumstances, you don’t always need the biggest machine around. If you’re looking for a chainsaw that you’re mainly going to use for cleaning up overgrown weeds and chopping down unhealthy branches from the trees in your yard, you might want to consider the Black & Decker LP1000. This little machine features a jaw cutting design that’s ideal for the backyard and it’s also quite affordable at under $100. This Black & Decker saw relies on a powerful set of jaws to perform its cutting action. It features two small blades on either side wrapped with a chain that you use much like a pair of scissors. This is a very effective method for cutting small branches and for eliminating weeds in your backyard. As long as you use it for what it’s designed for, it is a very effective tool, but it’s not meant for chopping through large pieces of wood. Most of us are very conscious of the impact we have on the air around us these days and that’s why it’s never a bad idea to look for environmentally-friendly products when it’s at all practical. This jaw saw has the added benefit of being an electrical tool so it produces zero admissions. You can use this saw whenever you need to, comfortable in the knowledge that you’re not creating a potential environmental problem for your children and your children’s children. Whenever you’re considering purchasing an inexpensive tool you’re bound to be a little concerned about the quality of the product. By most accounts that’s not a major problem with this Black & Decker jaw saw. It’s a quality product for the price, and the chain bar and the chain are both made of durable steel that is designed to last. As we previously alluded to, it’s not a good idea to try and use this machine for large jobs. The length of the jaws is only 4.5 inches, so for larger pieces of wood you probably wouldn’t even be able to get a grip to get started. It might be a good idea to have this saw as well as a traditional chainsaw, depending on the type of job you’re going to be doing on any given day. If owning two different saws is not really an option for you, it might be better to look for a traditional chainsaw with a much longer blade. Another great advantage of this chainsaw design is that it’s very easy on the body. The scissor-style design minimizes the impact of vibration on the body, making it easier to work longer. The plastic covering over each of the jaws’ teeth protects you from the potential for kickback, which can cause serious injury. With this machine you’ll never be exposed to direct contact with the blade unless you’re being extremely careless. One thing that I’m always on the lookout for when I’m considering purchasing any power tool is the type of warranty it includes. When it comes to chainsaws the minimum warranty is about two years, and that’s why I was quite disappointed to discover that this saw only comes with a two year warranty. This may be the industry standard, but it would’ve been nice to see a much longer warranty – in the range of 4 to 5 years. You won’t have to worry about being weighed down when you use this saw as it only weighs in at about 6.5 pounds. That makes it one of the lightest chainsaw style products on the market; that’s an important consideration if you have any kind of physical limitations. At that weight it is quite manageable and you’ll probably be able to get through your work without even noticing much strain in your shoulders, forearms, or back at all. When you’re looking at an electric powered yard tool it’s impossible to ignore the fact that you have to put up with a cord. It can be quite annoying trying to keep the cord out of your way as you work, and there’s also the fact that you have to make sure you have an extension cord that’s long enough. It is true you won’t have to refuel constantly, but being limited by the length of a cord is something that some people aren’t willing to put up with. The one thing that struck me about this jaw saw was how many positive reviews this machine has actually had. For such a popular product it’s quite amazing that there haven’t been more negative comments directed at it. When people have run into problems with this saw, it has generally had something to do with the jaw seizing up or the chain coming loose. Since this is a rare complaint I would have to wonder if it’s more to do with the way that these people are using the product. After all, it’s not meant for large jobs and if you were to try and use it on larger pieces of wood it would probably seize up. Tools generally fail because they’re used in a way they weren’t meant to be used, not because of a faulty design. 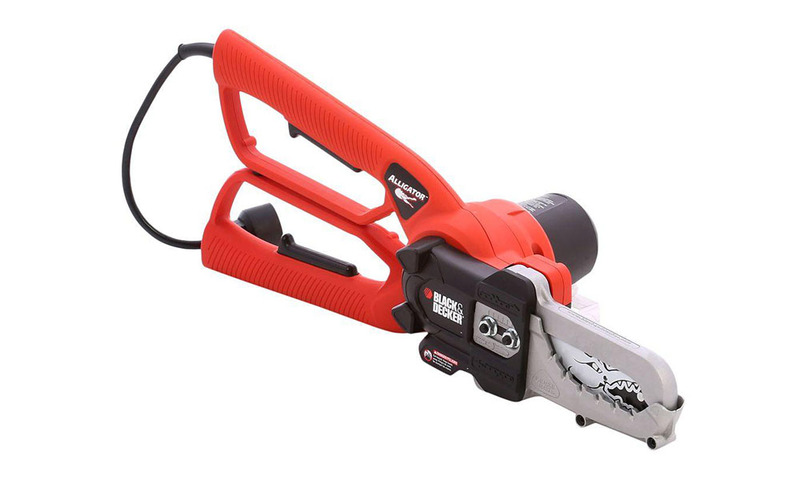 As long as you keep in mind that the Black & Decker LP1000 Alligator Lopper 4.5-Amp Electric Chain Saw is only meant to be used for small cutting job, it’s a great tool for any back yard. It’s also a nice bonus that it’s environmentally friendly as well.